Strip the basil leaves and cut each bocconcini into three pieces. Arrange the tomato slices side by side on a large plate. Place a basil leaf on each tomato slice, then top with a slice of bocconcini. Garnish with plenty of black pepper powder and a generous drizzle of olive oil. 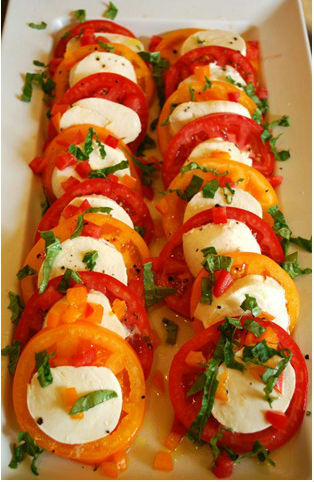 Feel free to comment or share your thoughts on this Insalata Caprese Recipe from Awesome Cuisine.